I am very excited because this is my first DIY! I thought a body scrub would be perfect to share. Most times body scrubs cost an arm and a leg. So I decided to make my own. 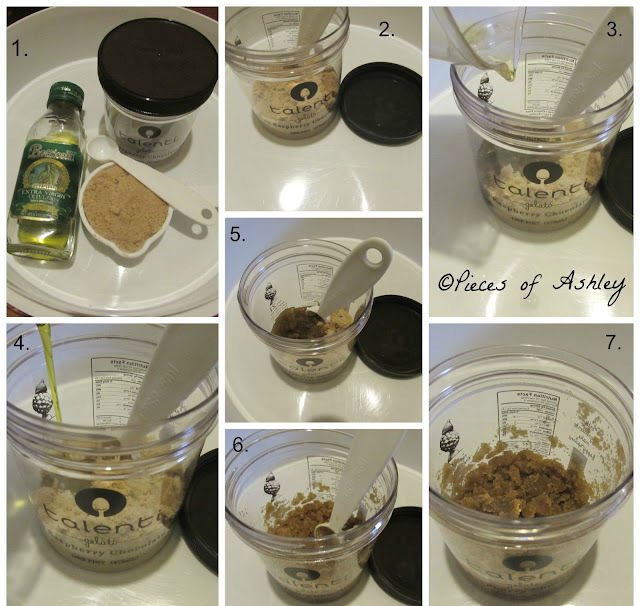 The most popular homemade scrub has brown sugar and olive oil. Before I used it, I wanted to do my research to know why this sugar was great to use. I went on livestrong to do my research. During my research I was surprised to find out that brown sugar was not just used for foods and desserts. Brown sugar is the softer sugar, which makes it a great component for the skin. It's strong enough to eliminate those dead skin cells that maybe left after a shower or a bath. Olive Oil is great for the skin as it is use to soften the skin and lock in the moisture. That's why people use it for their skin and hair. It's very easy to make and both ingredients compliment each other! - A mason jar or use a container. All I did was wash out this ice cream jar, nothing fancy! I am probably a late bloomer with this body scrub/ exfoliator, but it's better late than never. I used this as a full body scrub and it works really good. If you have not tried this, it's very worth it. Again it is very easy to make, you probably have these ingredients at home, and it's simple but works effectively. I recommend you all to try this out. Maybe during a spa day at home or every week. The best part about this scrub is that it's versatile. It works as a facial, lip, and full body scrub. This is great if you're on a budget! You should definitely make this apart of your daily routine and lifestyle. I hope you enjoyed reading. Let me know if you have tried this before and if you have not, try it!